Welcome to Prepaid Phone News' regular Sunday Prepaid Phones on Sale this Week post listing the best current US prepaid and unlocked phone deals. This week's Deal of the Week is for Cricket Wireless customers. The Alcatel OneTouch Idol 3 is on sale on the Cricket site for just $79.99 when purchased with $40 or more of airtime. The Idol 3 is a solid mid-range phone that launched on Cricket in November for $149.99. The unlocked version of the same phone costs $199.99 on Amazon. The Idol 3 features a 5.5 inch 1920 x 1080 px HD screen, 1.5 Ghz octa-core Snapdragon 615 processor, 2 GB of RAM, 16 GB internal storage and a micro-SD slot. There are 13 MP main and 8 MP front facing cameras, front facing JBL speakers, NFC and dual-band 802.11b/g/n WiFi. If you port a number from another carrier (ports from AT&T excluded) the Idol 3 price's drops to $49.99. Porting also makes you eligible for a $50 ($100 if porting from T-Mobile) account credit after your second month of service. I don't recommend this phone if you do not plan to use it on Cricket. The phone is locked to Cricket. Cricket will unlock it after six month paid service but 3rd party unlocks do not seem to be readily available for this phone. All current prepaid phone deals: (Except as noted all are available both online and in stores). Amazon Online only. Free shipping on orders $49 and up. AT&T GoPhone (online only) free shipping on all phones and online-only discounts on most phones. BestBuy Free shipping on orders of $35 or more. $30 switcher rebate - requires porting a number from a non-Sprint based operator, purchasing a new Huawei Union, LG Tribute, ALCATEL ONETOUCH Elevate, HTC Desire 510, Kyocera Hydro REACH, LG Tribute 2, LG Tribute 5, Moto E, ZTE Prestige, ZTE Speed, ALCATEL ONETOUCH Conquest, HTC Desire 626s, Samsung Galaxy Core Prime, ZTE Warp Sync, LG Volt 2, Samsung Galaxy J3, ZTE Warp Elite, LG Stylo, LG Stylo 2, ZTE Max+ or Samsung J7, activating on a Boost monthly plan and keeping the account active at least two months. Ends 6/22. $50 switcher rebate - requires porting a number from a non-Sprint based operator, purchasing a new Samsung Galaxy S3, Samsung Galaxy S4, Samsung Galaxy S5, Samsung Galaxy S6, Samsung, Galaxy S7, iPhone 6, iPhone 6 Plus, iPhone® 6s–16GB, 6s Plus, activating on a Boost monthly plan and keeping the account active at least two months. Ends 6/22. iPhone 5s 16 GB $249.99 (reg $299.99) + $100 account credit if activating on a new line and keeping account active for at least two months. $50 bill credit for port-ins. Ports from AT&T excluded, ported number must be active on Cricket 45 days, credit will be received within 60 days after activation. Discounted phones for port-ins: LG Spree 99¢, ZTE Sonata 2 $9.99, HTC Desire 626s $19.99, ZTE Overture 2 $19.99, Kyocera Hydro View $29.99, ZTE Grand X3 $59.99, Microsoft Lumia 640 $39.99, Alcatel OneTouch Idol 3 $79.99 when you port your number to Cricket. AT&T customers excluded. Unlocked GSM iPhone 5 16 GB (manufacturer refurbished) $129.99 Free shipping. Verizon (or Selectel) Samsung Galaxy S4 I545 LTE Android phone (new) $131.09 Free shipping. Verizon (or Selectel) LG G3 VS985 32 GB Android phone (new) $210.00 Free shipping. Unlocked BLU Dash J G D070X HSPA+ dual SIM Android phone $37.99 (reg $44.99) ends 5/14, in stores only. Unlocked BLU Studio G D790U HSPA+ dual SIM Android phone $64 with email promo code (reg $84) ends 5/14, in stores only. Unlocked Motorola Moto G (3rd gen) 8 GB Android phone $159.99 with email promo code (reg $179.99) ends 5/14, in stores only. Unlocked Motorola Moto G (3rd gen) 16 GB Android phone $199.99 with email promo code (reg $219.99) ends 5/14, in stores only. $25 off $50 or more purchase when you pay with Visa Checkout and use coupon code CP 163511. Ends 5/31. Mail-in rebates require 2 months paid service. Unlocked Moto X 32 GB (2014) LTE Android phone $199.99 use $50 off code SPRINGISHERE to reduce the price to $149.99 ends 5/17. LG Nexus 5x LTE Android phone 16 GB $199 (reg $349), 32 GB $249.99 (reg $399) when activating a new Project Fi line of service. Ends 6/9. Straight Talk Free overnight shipping on phones $29.99 and up, ends 6/20. Some items have very limited availability, especially with prices ending in .98 which indicates a clearance item. Use Brickseek's Target Inventory Checker to check for price and availability in your area by DPCI number (after price in listings below). Samsung Galaxy S6 LTE Android phone 32 GB $249.99 refurbished. Samsung Galaxy S6 Edge LTE Android phone $299.99 refurbished. Tracfone Free overnight shipping on orders of $19.99 or more, ends 6/20. Verizon Prepaid Online only. Free overnight shipping, minimum $45 airtime purchase required with all phone purchases. iPhone 5s 16 GB $249.99 (reg $299.99) plus a $100 account credit for activating an iPhone 5s on a new line. Walmart Free shipping on orders over $35. Ship to store free. Updated 5/13: New Motorola deal. Boost list is missing the iPhone 6S, $100 discount off list price. Ting has added several new phones, discounted others and still sells a new LG Volt 2 for $66 that should work with other Sprint MVNOs. ATT GoPhone ZTE ZMax2 is $59.99 certified like-new. Choose the $45 plan but at checkout click on Remove and delete the airtime card. You will then pay for just the phone. When it comes in, pop in YOUR sim card. Love mine, best deal out there if you need a GSM phone!! Cricket iphone 5s 16GB for $149.99 is missing. Missing if you try to buy one, you mean? It's been out of stock for a bit now. I wonder if they offer a rain check or it's another bait and switch. Its been out of stock and back in stock about 3 times yesterday. Check back often. Based on info in other FB page... Cricket policy of giving unlock code with 6 months payment is incorrect. Actually it will be after 7months of payment including initial payment. HSN.com has 15% off all cell phones now! Shop carefully. E.G., Apple prices are still far above list price after the 15% discount. Motorola prices are higher than competing sources after 15% off. 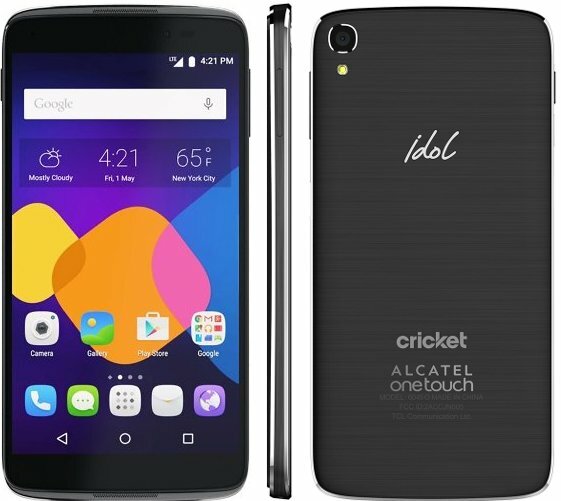 How much is the Idol 3 if you're already on a Cricket 5-line family plan ($100/mo. ), and you just want a new replacement phone? The upgrade price should be $79.99. I believe you also have to buy airtime. If you are buying it as an upgrade the airtime payment will will be applied as credit ton the next bill. The idol 3 is the best midrange phone of its type. When the 4 and 4S come out it is really going to be nice. When will the Idol 4 and 4S come out? Still waiting on the Idol 4 and 4S release date. Unfortunately the price is gonna be up there. It's about $300 for the 4 and $500 for the 4S. Considering the 4S is the same size as the Idol 3 5.5, and the Idol 3 released at $250, that's QUITE a jump in cost. Alcatel should have stuck with the $200-$300 range. The AT&T iPhone 5S for $245 is better than it looks, since a $45 plan card is included. You could sell that plan on eBay and you can use this new iPhone with AT&T MVNOs. 6", wow. but lollipop, boo. no thanks. not until I can find a "App Ops" app that works or marshmellow to control peskie aggressive app permissions. I agree. I wonder how long it will take for Marshmallow to be predominate OS in the low to mid price Android phones ? "... no thanks. not until I can find a "App Ops" app that works or marshmellow to control peskie aggressive app permissions. " did anyone try activating new sprint prepaid /boost /virgin phones on ringplus ? Tiny print at bottom of Boost $50 "switcher" rebate says you can get it "with new monthly plan activations OR upgrades & porting from non-Sprint related carriers,"
This makes the rebate more attractive. CORRECTION to post above: The rebate phones have to be purchased by 6-8-16. Rebate must be MAILED by 6-22-16, the date listed above. Verizon prepaid increases data and decreases the wholesale cost of data Hence the increase in data on Total Wireless and Page Plus. Can I port a Google voice number to Cricket and get the Idol 3 for $49.99 and the $50 account credit? To get the credit you need to port in from a mobile operator other than AT&T. You could port the Google Voice number to mobile operator and then to Cricket. Or get a new number from a mobile operator port it to Cricket and forward the Google Voice number to it. 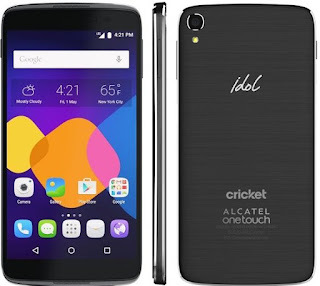 Could I still get the Idol 3 for $49.99 by porting a Google voice number to Cricket? No, it would be $79.99. You need to port in a non-AT&T mobile number to get the $49.99 price. "The phone is locked to Cricket. Cricket will unlock it after six month paid service but 3rd party unlocks do not seem to be readily available for this phone." Is this because there aren't any unlock codes for this particular phone model or because it's locked by Cricket? 3rd party unlock codes are available for some Cricket phones but not for the Idol 3.